With so much more money up for grabs than usual, Intertops Poker’s FPP (Frequent Player Points) Races will be keeping the popular online poker room’s tables busier than ever throughout August. 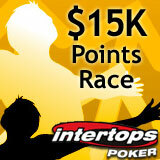 Every week, the top 60 point-earners will each get a share of that week’s $3750 prize pool. There will be four week-long races in August awarding a total of $15,000 in prize money. The month will culminate with the Bluff Europe Free Roll August 28th when Intertops will put $2000 in the pot. Intertops Poker players earn Frequent Player Points whenever they are dealt cards at any real-money cash game or pay a tournament entry fee. Points are automatically converted into Gold Chips which can then be redeemed for prizes, free poker tournaments or as non-deposit bonuses. On August 28th Intertops Poker will host the Bluff Europe Free Roll Tournament and will put up $2000 in prize money. There are no qualifying requirements and all players are welcome. This special month-end free roll tournament is in addition to the $25,000 Weekly Guaranteed Tournament and $1000 Guaranteed Freeze-out Tournaments each held every Sunday. Intertops Poker recently installed a major poker software update with a slick new look and advanced tools for online poker tournament players. For those playing a lot of tournaments rather than Sit n Go games, the new direct tournament registration and excel-style sheets for organizing schedules are helpful. The new software also features a Tournament Notifier enabling players to filter the tournament notices they receive and a Tournament Calendar to remind them about online poker tournaments they’ve registered for. Re-sizeable tables can be scaled down to industry-standard minimum size and the Tournament Lobby now includes links to Satellites. Intertops has been one of the world’s most trusted online poker room, casino and sportsbook sites for more than fifteen years. Known for its amazing customer service, players know Intertops has the best bonuses and promotions and that they can withdraw and deposit without hassles. Intertops welcomes players from around the world. Complete details of Intertops Poker’s August FPP Races are available on the “Promotions” tab at http://poker.intertops.eu.